It has been a busy few days here in the Adirondacks. If it isn't real estate or consulting work keeping me busy, it is the skiing. Yes, this is the time of year when ski obligations take precedence and a tad more thought. That is, this is time of year we think about what time of day to ski since timing is everything and it behooves one to consider when the snow will 'corn up.' This is when one worries more about sunburn than frostbite. In the North Country, cold nights and warm, sunny (Oh, the sun!) days create maple syrup and corn snow; two of my favorite things. Skiing conditions at Whiteface have been absolutely stupendous these last few days, especially for us 'fair weather Whiteface skiers.' Ski confession time here.....I am one of those fair weather Whiteface skiers. I don't do the 20-below-zero days on the hill because when that bone-chilling cold strikes, I am zinging through the woods on my cross-country skis and staying warm. Spring time however, is the best time to ski Whiteface. 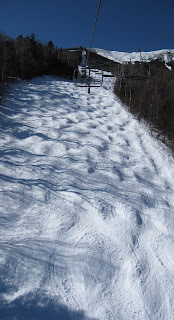 If you time it right, which I did this week, corn snow is as lovely to ski as thigh-deep powder. Today's featured photo highlights the knee-aching moguls on Lower Skyward yesterday, Telemark Tuesday.